Bathroom - Shower over Tub with Dual sink vanity. Full kitchen with dishwasher, laundry, large deck with blue water & Morro rock views. In the heart of downtown Morro Bay, within walking distance to many shops, restaurants, and the Embarcadero. Enjoy your vacation in Morro Bay without having to hop in the car! A new bar and grill just opened up on the corner of Main and Harbor, called "The Siren". Its a very fun place to go, however they have fantastic live bands that play nightly and guests have mentioned they can hear the bands from the homes. We hope this won't interfere with your stay, but sensitive sleepers may want to bring ear plugs. Being in the heart of downtown allows you to enjoy all the daytime activities and the fun nightlife. Well, we have been going to Morro Bay for 30 years. We never stayed in town, usually we stay in SLO. But, this year I found this great duplex. Everything is walking distance. Great places to eat, just up or down the street. You can easily walk to Morro Rock. The duplex is comfortable, ample size for a family of 4. I truly recommend it. We totally enjoyed the house! Clean and it fit our needs perfectly. Everything was within walking distance which was a plus. Just the right size for me and my two kids. Walking distance to many cool restaurants and attractions. The property is super clean, nice decor and very cute!! It was perfect for our family of 6. The location was great and everything is within walking distance. We would definitely visit again and recommend to friends. 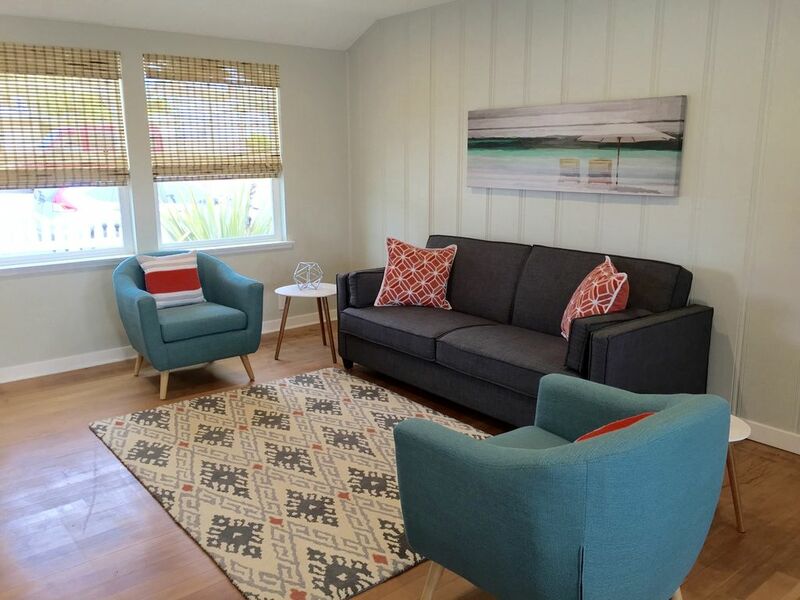 It is two connecting units with a shared back patio which would be perfect for 2 vacationing families to rent together. Property manager was very nice and very responsive! Overall great experience! Truly enjoyed our stay in Morro. Will definitely stay here again. Very cute place right down the street from all of the action. The place is super clean and super cute. Very well laid out and roomy. Rates are subject to change until reservation is confirmed. Our $50.00 booking fee plus the City's 11% tax, a total of $55.50, is non-refundable.